The crocodile is dead! And long live it. As announced today, Lacoste's "Save Our Species" campaign won two golds in the Clio Fashion & Beauty awards—in Partnerships & Collaborations and Public Relations. 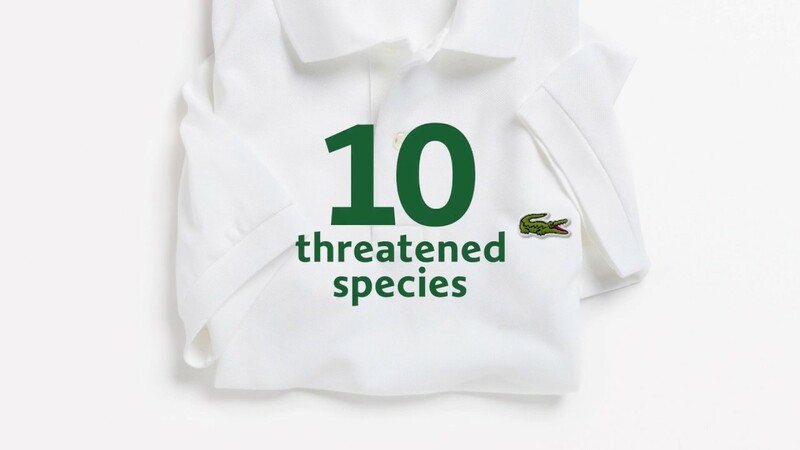 The work kicked off a three-year partnership between the French clothing company and the Union for Conservation of Nature (IUCN) and highlights 10 endangered species across a series of limited-edition polo shirts. It also marks the first time Lacoste has initiated a logo change in its famed crocodile's 85 years, grinning over cotton. "It was a simple but powerful idea that gathered Lacoste, the International Union for Conservation of Nature and [Paris agency] BETC around the same ambition—raising awareness on the condition of threatened animals," BETC executive creative director Antoine Choque tells Muse. The limited-edition shirts launched during Lacoste's runway show at Paris Fashion Week on Feb. 28. They sold for about $183 each, with sales going directly to the preservation of each species chosen. The 10 animals were hand-selected by the IUCN, Lacoste and BETC, and the number of shirts available for sale reflected a ratio of how many of each animal remain in the wild. To wit: Of 1,775 shirts total, 450 featured the Anegada Rock Iguana, while just 30 featured Vaquitas (a species of porpoise). "The crocodile is one of the 10 most famous logos in the world," Choque says. "Lacoste fans are very attached, very engaged on social media every time the brand showcases it. This is why we suggested Lacoste turn this icon into a megaphone drawing public attention to threatened animals in the wild." It's hard enough to get a great idea to survive the scrutiny of clients; harder still to ask them to change a retail production line; and perhaps hardest of all to ask a renowned brand to do away with its logo entirely (even if only for a short time). But that's exactly why the idea won. "Lacoste immediately liked ... the strong commitment it represented," Choque says. "The initiative appeared natural to a brand represented by a crocodile." (We're assuming this is a reference to the deceptive nature of their tears.) "Also, Lacoste was already involved in the 'Save Your Logo' program a few years ago." "Save Your Logo" was a biodiversity program in which brands generated donations to save the animals that inspired their own logos—not a big jump from there to "Save Our Species." Still, there's a difference between using your own logo to do good and replacing it with other creatures, however noble. "Lacoste had to adapt their production process in a very short time to create new embroideries for each of the 10 animals," says Choque. The logos were created with the same embroidery approach as that used for the crocodile, which has lived on the heart of Lacoste's polos for 85 years in homage to founder René Lacoste, nicknamed "the Crocodile" because of his tenacity on the tennis court. Global account director Fanny Buisseret adds: "The IUCN was involved from the very beginning. ... They loved the idea and were deeply involved, sharing key information about the species to build the operation. Nothing would have been possible without their expertise and precious advice all along the process." Because we couldn't resist, we asked which species sold best. "There were not the same number of polos for each species. The Vaquita—only 30 polos—was the first to sell out," Buisseret says. "But all polos sold out in 24 hours, so all species were equally liked." That's a pretty happy ending. Reflecting on the best part of journey for him, Choque recalls the reveal day at Paris Fashion Week. "We were all united—Lacoste, IUCN and BETC—to see this project going live after so much dedication. We were moved and excited to see the first positive reactions around this project we all believed in." And never mind how quickly it sold out, Buisseret says "Save Our Species" was covered by media around the world, "even in countries where the polos were not sold. But most importantly," she continues, it "helped develop awareness and increased donations for IUCN: Donations multiplied by four during the operation. Traffic on saveourspecies.org increased 200 percent for the month of March, and newsletter subscriptions increased 300 percent" that same month. "It's a three-year partnership between Lacoste and IUCN, so this was only a first step in this collaboration," Choque says, promising more to come. "Also, the Mexican government sent Lacoste a letter to thank them for raising awareness on the Vaquita, for which they have a conservation and protection program." Well, the Vaquita can sleep well tonight. See all of the 2018 Clio Fashion & Beauty winners here.